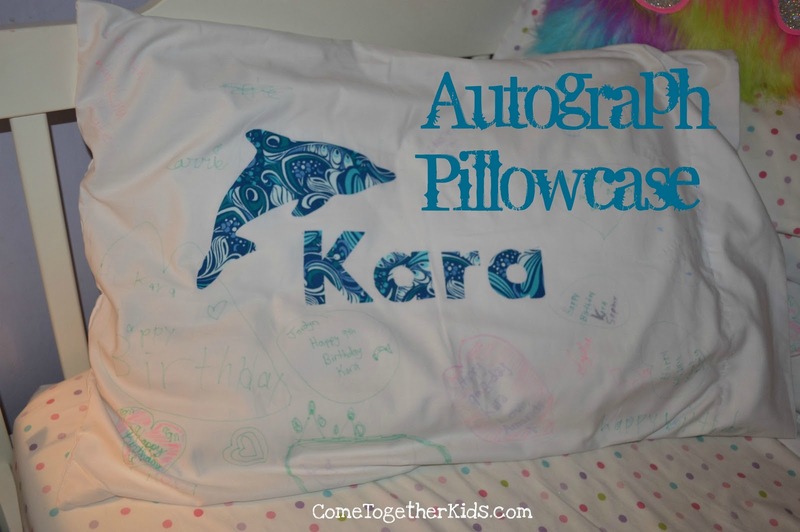 Come Together Kids: Personalized Autograph Pillowcases. I really like having fun little keepsakes from parties and special occasions. For my oldest daughter's First Communion this past Spring, I made this Guest Book Table Runner for all our guests to sign for her. She loved it and I liked tucking it away as a special memento. For my girls' recent birthdays, I wanted to do a similar keepsake. I ended up making them some personalized autograph pillow cases. They were inexpensive (a 2-pack of pillowcases was just $10), easy to make (I made both of them in under an hour the morning of the party! ), their little friends loved signing them at the party and my girls love falling asleep on pillows signed by some of their favorite people. 1. Find a font and/or stencil you like on the computer, then enlarge it to the size you want. 2. Trace your letters onto the paper-y side of the Heat'n Bond. You'll want to make sure you trace the letters backwards so the right side will be facing up when you iron it on the fabric. Notice how the letters are backwards? 4. Cut out your letters and/or shapes. You'll notice that it's really easy to cut the letters out because of the paper backing from the Heat'n Bond. 6. Allow your friends to use the fabric markers to sign your new personalized pillowcase! The signatures are a little tough to see in the picture, but look super cute in real life! I love that Heat 'N Bond stuff too ... a total lifesaver for people like me who love fabric crafts but have limited sewing abilities. Your pillowcase turned out awesome! There is a need to give extraordinary care and thoughtfulness regarding understudies who have some sort of impedance or exceptional needs to guarantee their nonstop scholarly development and learning advancement Buy Essay Online from EssayStar.co.uk. Around the globe, there has been a consistent increment of understudies with incapacities in many schools, in contrast with the general populace of normal understudies. A current insights from Student needs. I want to have everyone autograph pillowcases as an activity which will be taken home as a party favor. Should we use Permanent markers OR fabric markers? Bought this for my girl to take to summer camp and 3 day UK Dissertations occasion. She cherished it. It's really delicate and is by all accounts well made. Much obliged to you for the considerable pillowcase to makes incredible recollections for the children. This blog is to a great degree valuable for me. It helped me in such gigantic quantities of ways. moreover, similarly Marketing Assignment Writing Service weblog here with a large portion of the critical information you have. appreciative to you for sharing it. 2019 BMW X5 is an accomplished SUV that wears its many different hats with aplomb. https://funmazavideo.com/zero-2018/ It seems like the actress is all excited for the film 'Zero' which will hit the big screen soon. Directed by Aanand L Rai, the film also stars Anushka Sharma.